We would love to see your work, and put it up on our Gallery and facebook pages for other to admire, enjoy and get inspired by! Please email your pics to Queen Bead, they will be appreciated and acknowledged. and some of her stash beads. Strung on fishing line and secured with crimps and knots. I love it!! 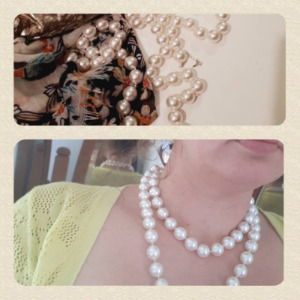 My pearl rope came out recently, I love wearing these! 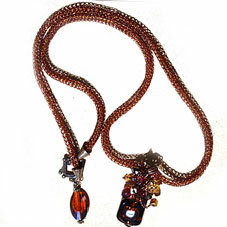 16mm Swarovski knotted on silk cord. 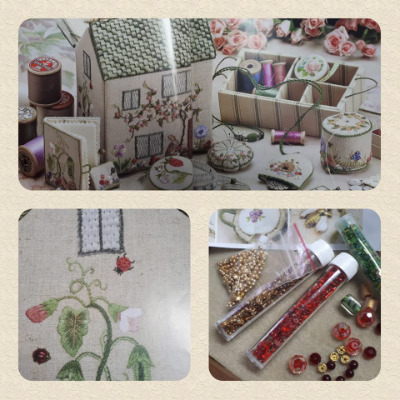 and embellished workbox features a lift out tray and 9 embroidery accessories. Sam sent in this fairy feature asking or it to be made into a bracelet. 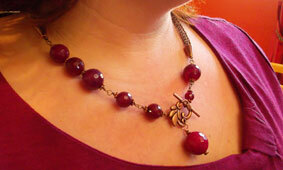 Nia used agate balls, our baby red roses and O beads as spacers. Strung on softflex and finished with a magnetic clasp. Crimp covers make the ends nice and tidy. Simple stringing is so effective! Czech glass beads spaced with 2 Miyuki drops. Superduo cuff beaded with turquoise duos and an earring combo. Loving it! 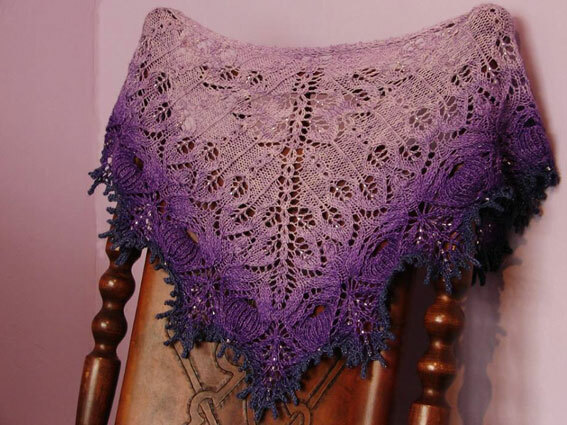 Look at this incredibly beautiful shawl/scarf - using our Japanese seed beads as the accents. 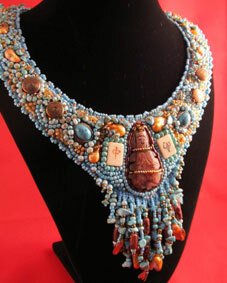 I feel honoured our beads are used in such a beautiful piece! shoulders - the perfect finishing touch. 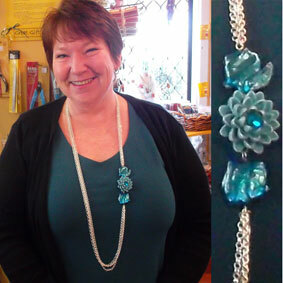 These great necklaces were stitched using delica beads and colourful rings - they look great on! which provide the perfect finishing touch tot he beautiful knitted work. 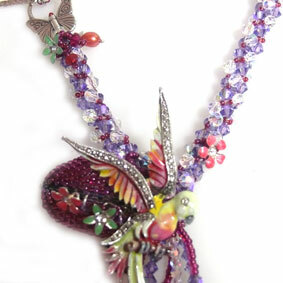 This necklace features an beaded orchid made using #11 seed beads and delicas. 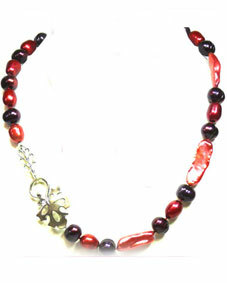 attached to a triple strand of freshwater pearls. The flower uses peyote and brick stitch. The same necklace and flower, but in gorgeous pink and gold. 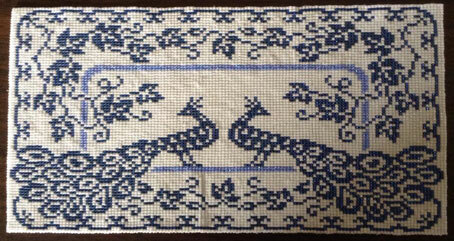 This stunning piece is entirely stitched with a needle and thread! 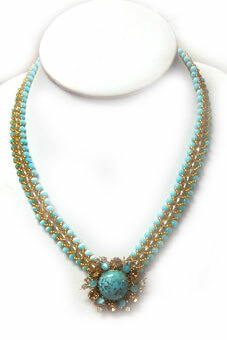 A long lariat style rope with a corsage style flower ending made around a semi precious stone, this wears beautifully. 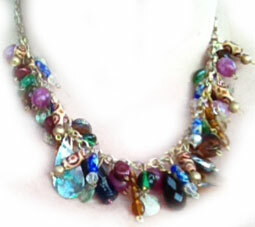 This lovely herringbone necklace has a vintage brooch clipped on as a central feature - the colours match perfectly! These cuties are perfect for holding together a winter cardy or embellishing a lapel or scarf. Get your base pin here. 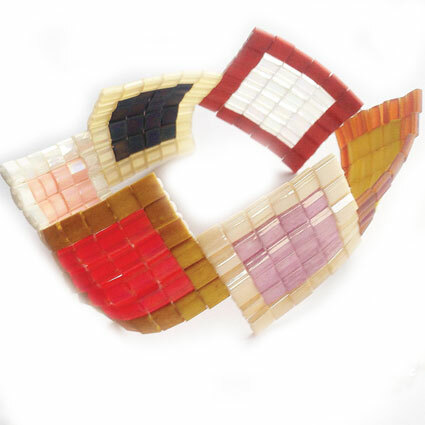 This 'never-ending' Tila squares bracelet looks fabulous on. 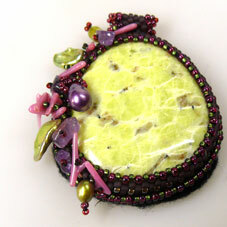 These semi precious stones have been glued to a foundation fabric, then bezelled with seed beads and embellished. 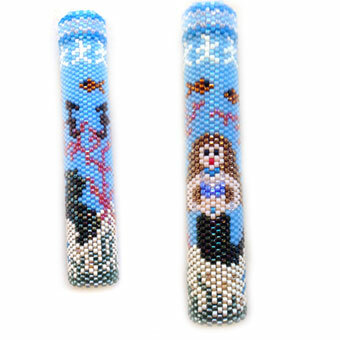 The basic bezel in all cases is done with Peyote stitch in number 11 and 15 seed beads. 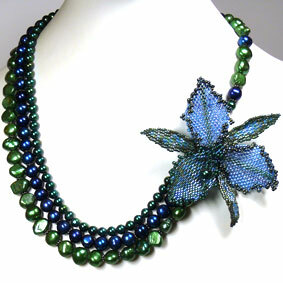 Embellishment is with semi precious chips and freshwater pearls. 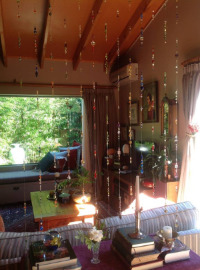 beads as a central feature - such a great combination. 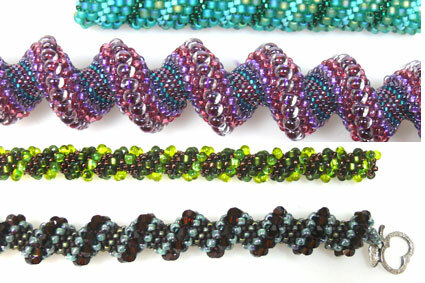 This is the same Spiral Rope pattern, but with different sizes of beads which give a different look. pattern - a lot of time and patience (and skill) has gone into it, love it! alternating colours and Swarovski crystal embellishments. I especially love the pearl one! 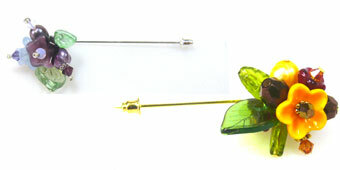 These earrings sparkle with Swarovski crystal, diamante enamelled headpins and Czech lampwork leaves. 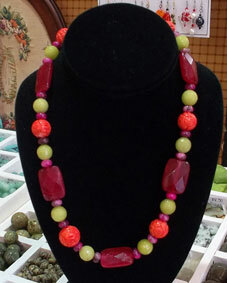 We have similar ones available in our Jewellery category. Do you have something special that you have made and would like to share? We just love seeing your work. Email your pic to Nia or post to our facebook wall. 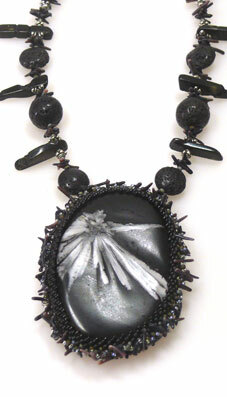 This necklace is strung on Conso and finished on softflex. A wrap around bracelet using Tila beads - I just love it! So much I had to buy it! Here is a utube tutorial link. If you want a kit, email Queen Bead with your colour preference, $15 each (button not included). NOTE: Use our Japanese Filament Cord for the base, Crochet Thread for the wrapping, or doubled Silamide. Thread the Silamide with a needle each end or use your fingers for the crochet thread. 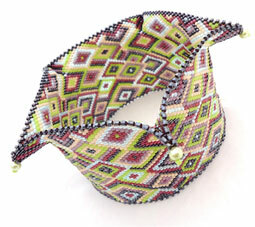 This beautiful bag was knitted by Naomi with seed bead hanks and embellished with Swarovski Crystals. There is a lot of skill and patience in this! "My collar was created from various beads found in your store (plus some from my stash). My Harmony ensemble (collar, cuff & earrings) were recently on exhibition at the Estuary Arts Centre in Orewa, where I won a Merit award." 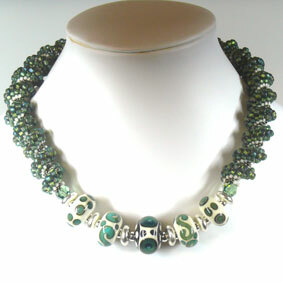 This lovely necklace was made to the Valorie Clifton 'Draconis' pattern. Queen Bead choose the beads, and Gaylene made it up. A lovely one for work, under a shirt collar, or out at night - very versatile! These fab bird feeders where made with beads and findings donated to Gladstone Primary School by The Bead Hold. 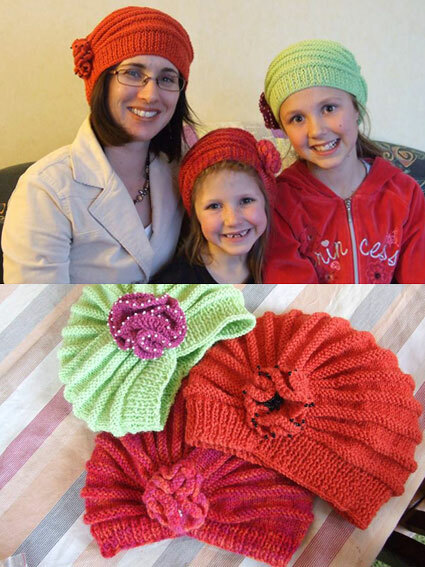 Such a fabulous idea and don't they look great! 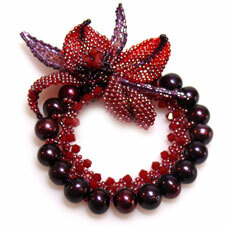 There are many different things beads can be used for. 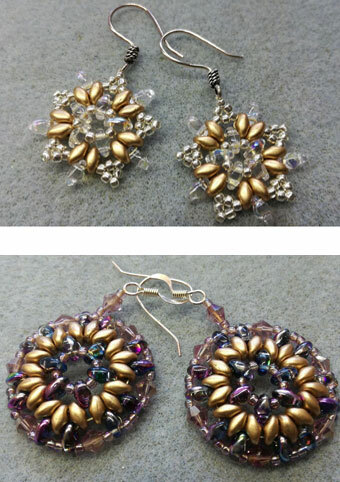 These lovely earrings were made with our 20g Silver Artistic Wire, and the shapes mainly made on a jig. 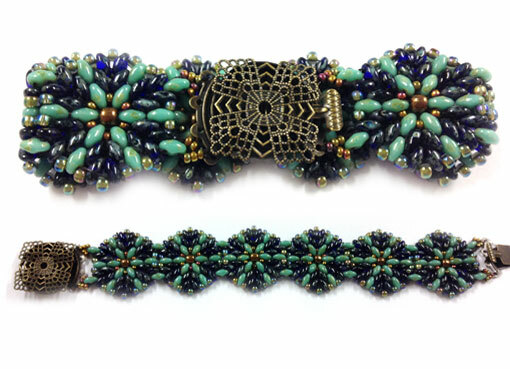 Originally Tish made the Deco Elements Bracelet at SENZ with Queen Bead. She then went home and made a matching necklace and earrings! Just lovely. 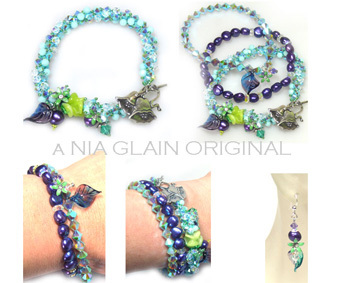 "Hi Nia, enjoyed making these Bracelets. They are 1 of yours (Dual Bands) & 1 of Valorie Clifftons. Love working with Superduo,s, Rullas & Tilas." 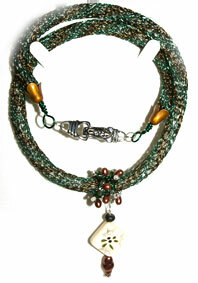 This lovely Viking rope was made using the 12 head tool and one of our dragonfly clasps. Tish made it as a birthday present for her sister. 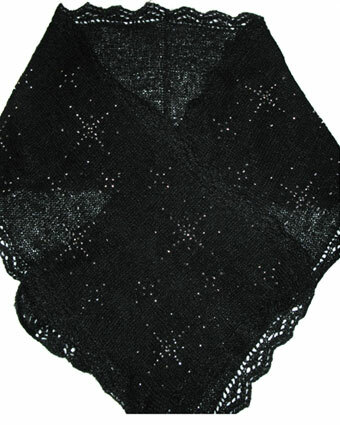 This beautiful shawl incorporates our #6 Japanese seed beads to form the starburst patterns. 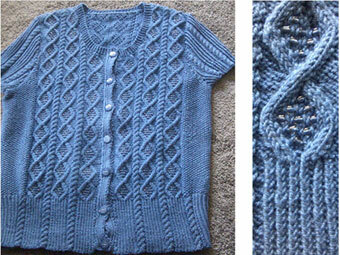 The beads were threaded onto the yarn first and knitted directly in with the pattern. Such a clever lady! This gorgeous looooong Russian Rope is the result of 3 weeks of evenings stitching - but so worth it! 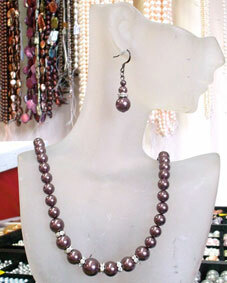 Looks great with the beaded bead ends. You can purchase the rope pattern here. "I bought the letters from Spotlight and painted them up, decorating them with Prima flower vines, glass tiles and beads. Loved it so much I did a second set, so I have one on the Bead Room and one above the sink in the kitchen! On the HOME letters I used our freshwater pearl mixes and also a porcelain flower." Yes! We stock the Prima Flowers and Glass tiles. Free glass tile instructions are on our 'HOW TO' page. An up-cycled vintage brooch (the parrot) combined with a crystal rope and various stitched embellishments along with a feature sterling toggle makes for a fab bling necklace with a twist! This was constantly evolving and such fun to make. "I made the wrap bracelet for my sister's birthday present. 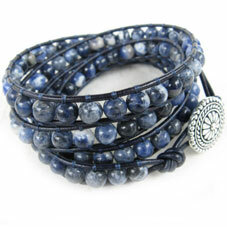 Her favourite colour is blue, so denim blue sodalite beads were perfect. They're woven onto navy blue Greek leather." 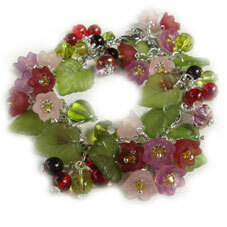 "Inspired by wineberry trees, and auctioned to raise money after the Christchurch earthquakes. 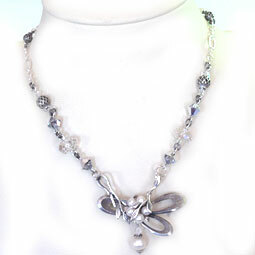 It's made with lucite flowers and leaves teamed with antiqued silver chain and glass beads." 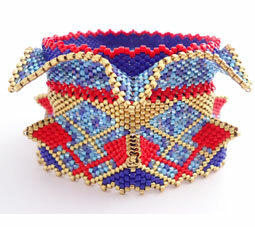 These amazing cuffs are highly technical work and beautifully executed. Hand stitched with flat and shaped peyote stitch, Jenny has used Japanese seed beads - essential for their regularity in work like this. 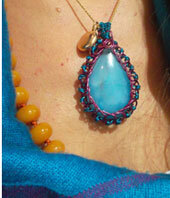 Both these pieces use Peyote stitch - such a versatile stitch! The basics can be downloaded from our How To page. 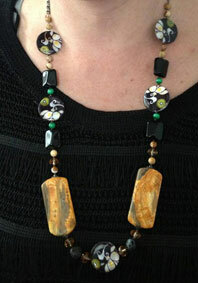 This lovely necklace features semi precious lozenges and shell feature beads. 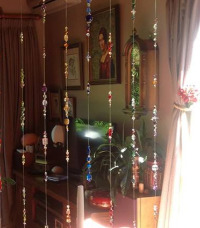 It is strung on softflex so it will stand up the the weight of the beads. Another vintage brooch, this clasps with sterling bails and linked with crystals and metal beads. 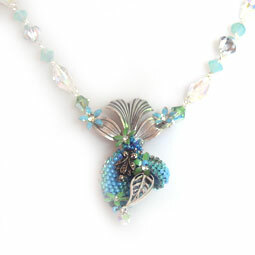 This necklaces features stitched leaves attached to a sterling component, then chain linked crystals for the sides. 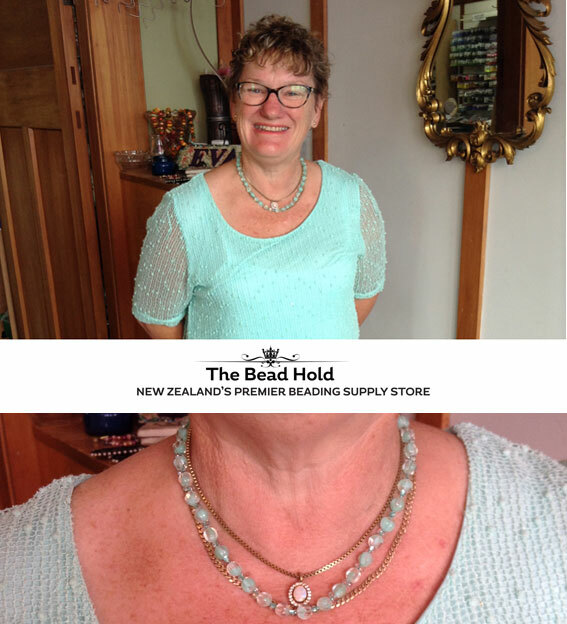 These are all made to Deborahs paterns with the new two-holed beads - Tila's and Superduos feature here - along with Japanese seed beads, Swarovski crystals and Swarovski pearls. And our fab magnetic clasps! - made by Kerry Hall . . . all of them! All hand stiched with a netted base. Viking Knitting makes a great rope, long or short. There is a lot of work in this one! 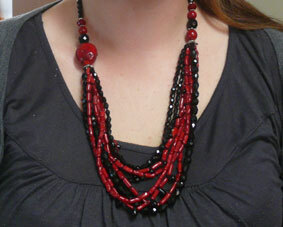 Orphan beads and old jewellery attached to a chain - if you can make a basic earring you can be successful making this! 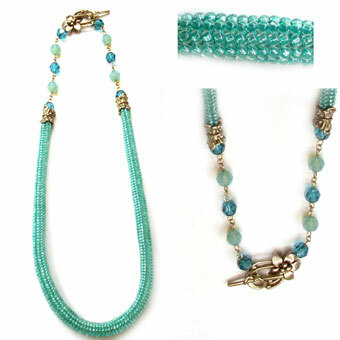 This bracelet set consists of one stitched crystal rope and 2 stretch bracelets, for a 'stackable' look. I really like stacked bracelets - and it is great to have the option to wear different combos. The sterling silver toggle, for me, just makes it - I love it! 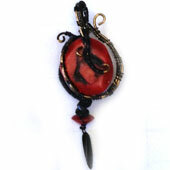 Plus earrings to match, my favourite style - we do have similar ones for sale. 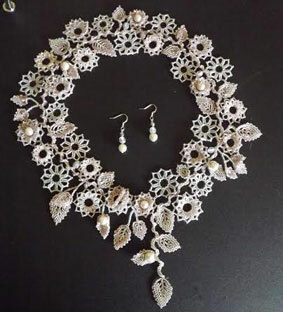 This exquisite piece was created for a bride, who must have been thrilled. Many many hours of work and fine stitching has resulted in this masterpiece of leaves and flowers. Nicky is an experienced stitcher which shows in the quality of her work. 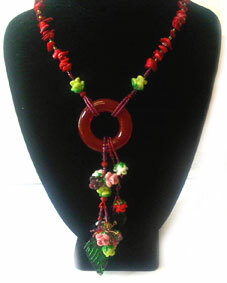 Made with Chinese blown glass beads and Czech Glass beads, strung on Softflex. All different types of semi precious stones, strung together on Softflex. GORGEOUS EARRINGS . . . so many options! 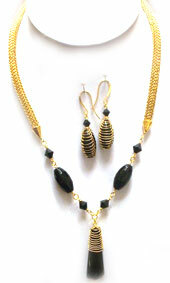 Basic chainlinking rocks. 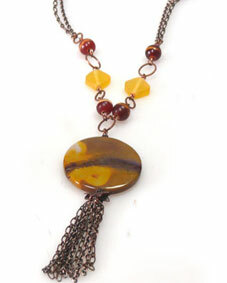 This gorgeous combo features a wire wrapped rivoli stone hanging from a Viking Knit rope. I wish it was mine! 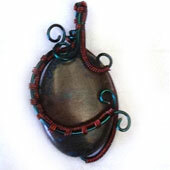 This peice uses Gunmetal coloured Artistic Wire. This will look amazing on! "This gorgeous old cameo was originally a brooch, given to me by my grandma. I chopped off the bar pin and linked through the top of the setting to turn it into a pendant. 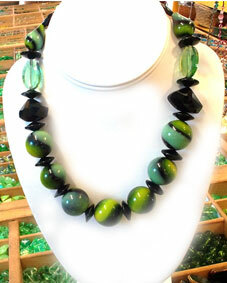 Combined with yellow and limey green pearls, this is one of my favourite necklaces. 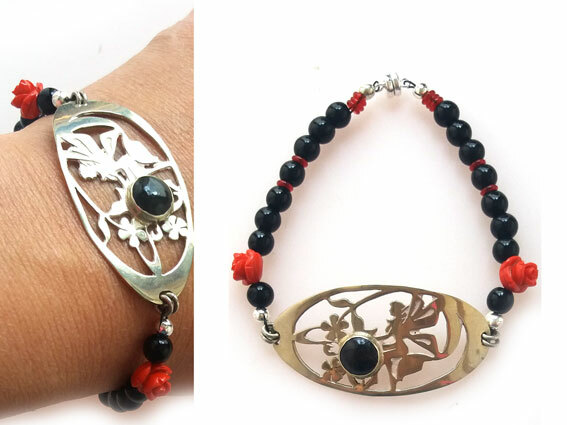 I think fondly of my grandma every time I wear it." This is a great way to make use of a little worn brooch be it a family heirloom or something you found in an op shop. 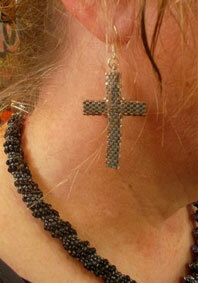 Simple chain linking skills can be used to make something similar. 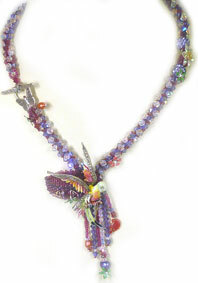 This beautiful Lariat was made with Swarovski Pearls strung on softflex . 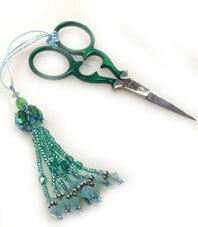 The tassels were stitched using Silamide, with a 'Beaded Bead' feature at the top. Specially made for 'Nan' for her 90th birthday - she loves it! 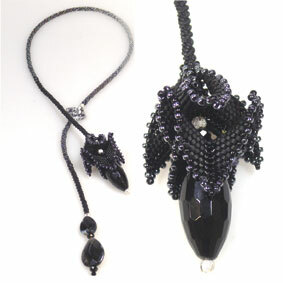 This tassel is made the same way, but with facets, crystals and seed beads. This is a great simple necklace that is so effective! 3 strands of chain joined to three chain linked beads . . . just fab. And in true Kerry style, a littlebling has been added - a dentelle glued to the middle of the acrylic lotus bead. 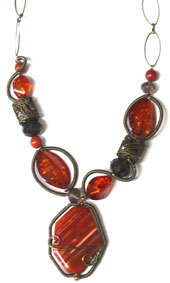 This style of necklace could also be doubled for a layered chain effect. 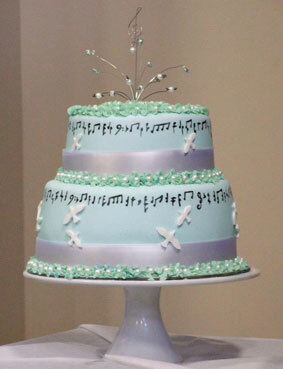 Queen Bead made this mint green beaded musical cake for a wedding recently . . . 2 1/2 strands of MOP pearls for the decorations. Although not edible, it was worth it as they were a perfect size and colour for the cake. 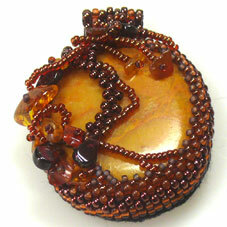 22g Artistic wire was used for the beads on top. 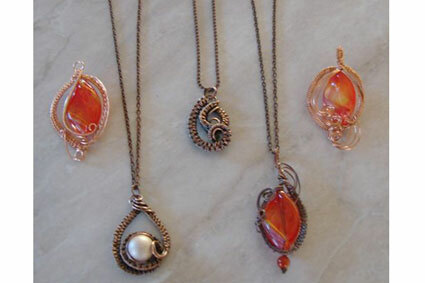 Isn't amazing the the different ways you can use your beads and wire! Her own wedding cake also had beaded toppers . 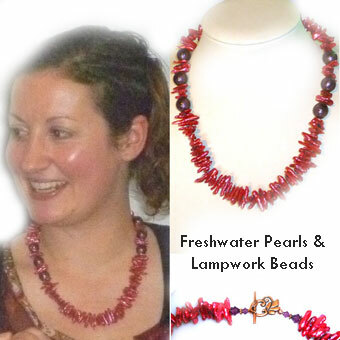 . .
Peyote & Brick Stitch with freshwater pearls & Swarovski Crystals. Agates, Czech Glass, handmade jumprings. 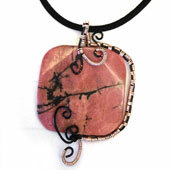 Wrapped with Artistic Wire. 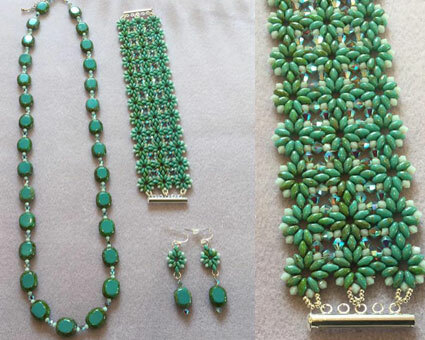 This gorgeous set has a real deco feel. 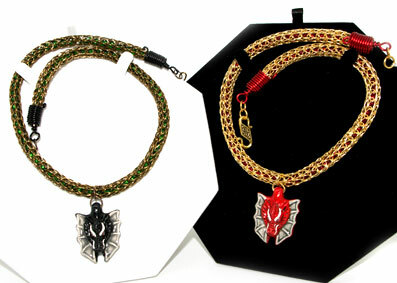 The main neck piece is basic Viking Knitting and then the earrings and pendant use the Viking Knit bead technique. 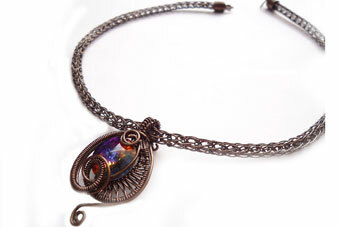 This chunky necklace used various wire working techniques and uses semi-precious, plamber and metal beads with gunmetal Artistic Wire. 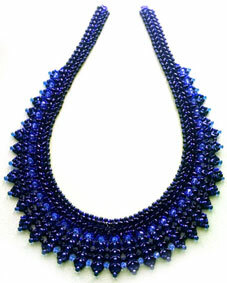 This lovely top uses our #6 seed beads to embellish the cable work. 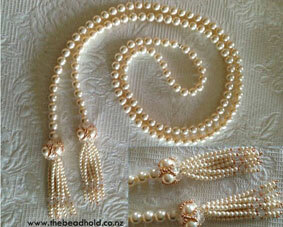 Beads are strung on first and then pulled up individually into the appropriate stitch. Yummy Necklaces using stitching techniques for the cluster drops and tigertail threading for the neckpieces. 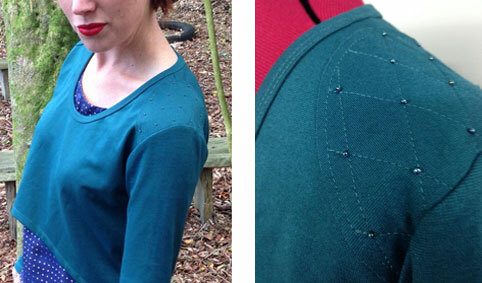 You need to be somewhat familiar using a needle and thread to make this project. This lovely piece made by our Kerry combines a basic Ndebele (Herringbone) rope with chain linked crystals and a feature sterling toggle. 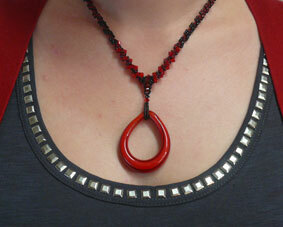 It can be worn with the toggle to either the front or back. 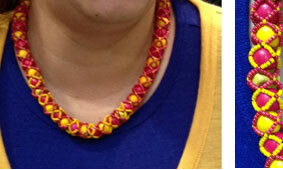 The rope was made using #11 Japanese seed beads. Note: if you are a beginner, we recommend at least one stripe to make it easy to find your place. Plain striped bracelets, a good way to learn the stitch. 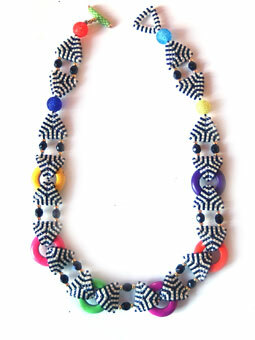 Ndebele Tubes make a great base for embellishment. 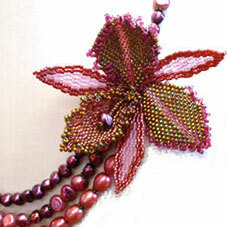 Use different sized seed beads to create a beaded bead effect. 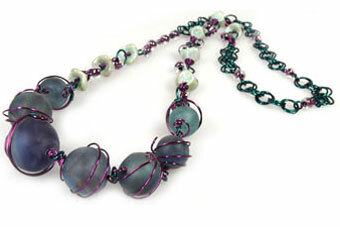 Mixed freshwater pearls knotted together with a feature Sterling Silver toggle as a feature. 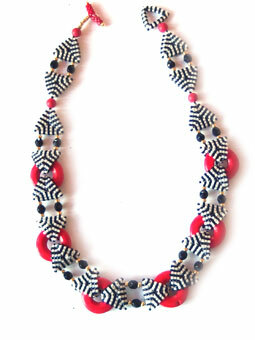 This necklace is to be worn long over a dress or top. 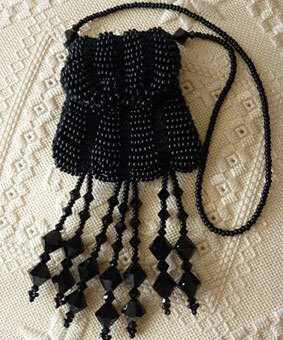 The tassel is handmade from medium chain. - created by Rosie Clarke. Pink Pearls . . . This is one of my favourite necklaces. 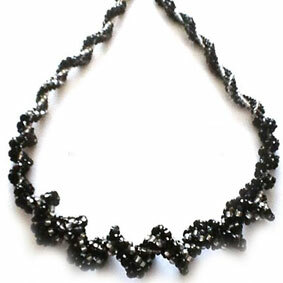 Strung on Softflex, this necklace can be worn as pictured or asymetrically. Crimp Covers make for a neat professional finish. This necklace is a longer length what what I usually wear and I am really liking the comfort and style of it. 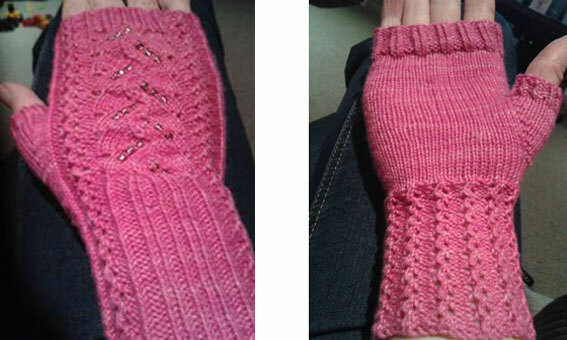 The toggle clasp is secure and nice and easy to do up and take off. Basic necklace stringing instructions here. 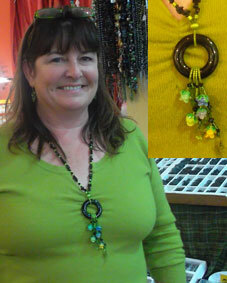 This lovely pendant was made after one of our Sparkle Pendant classes, and I love the way Theresa has put it together. 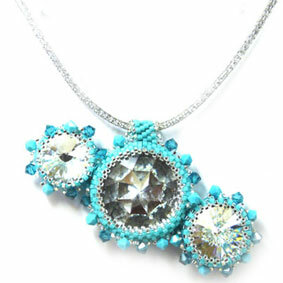 One large bezelled Swarovski Stone flanked by 2 bezelled rivolis and all embellished with Swarovski Crystal - bling bling!! 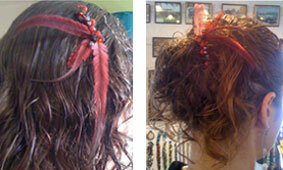 These are great with or without feathers. 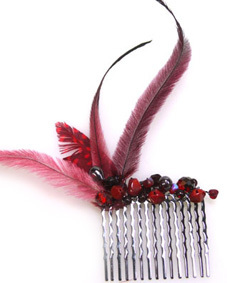 Beads and feathers are wired down to the haircomb with 28g wire. If using feathers, put them on first making sure the wire is wrapped nice and firm. Trim any extra fluff at the end.